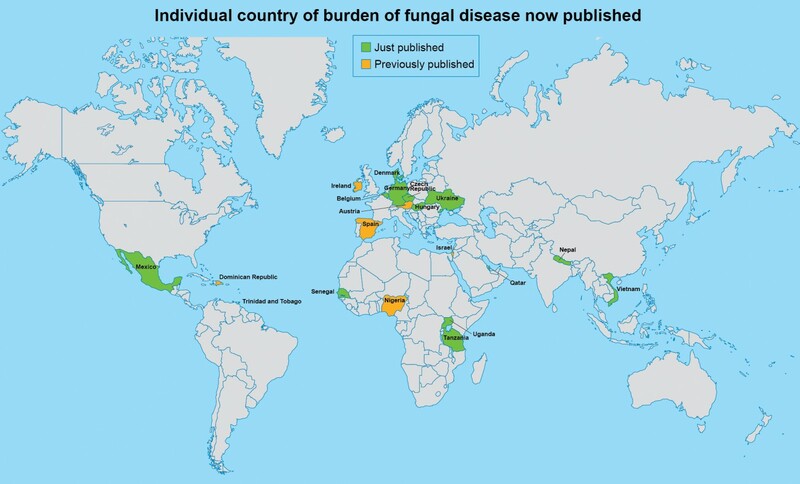 In the Journal Mycoses, Denning and 47 co-authors from across the world have estimated the number of people affected by serious fungal diseases in a population of 636 million in 15 countries: Belgium, Czech Republic, Denmark, Hungary, Nepal, Qatar, Tanzania, Trinidad and Tobago, Uganda, Germany, Mexico, Senegal, Tanzania, Ukraine, Vietnam. These estimates have never been attempted before. Population rates of serious fungal disease varies from 1.7% to 12.5%. Fungal diseases have been regarded as low priority problems and expertise is lacking in many countries. A similar methodology developed as part of the LIFE program was used in all papers. The largest burdens are always recurrent vulvovaginal candidiasis and ‘fungal asthma’ (ABPA and SAFS). AIDS and TB related disease reflect the burdens of these problems in each country and how well HIV is treated. In Africa, high rates of skin infections are found and only Tinea capitis in children is included with the ‘serious’ category. Rates were especially high in Uganda and Tanzania. An national estimate of Talaromyces marneffei infection (penicilliosis) was made in Vietnam. Professor Denning stated that he was ‘delighted’ that the years of work with his friends and colleagues is now visible to help conquer the unaddressed scourge of fungal disease in so many parts of the world. He said: ‘Fifteen papers published together – a once in a lifetime event’. A key goal for the Global Action Fund for Fungal Infections (GAFFI), is to document the burden of fungal disease across the world. These papers are an important public contribution to that policy objective. Beardsley Burden Vietnam Mycoses 2015.